LONDON – The idea intrigues Kobe Bryant: A farewell season beyond the completion of his Los Angeles Lakers career, a victory lap in a European destination that bookends a blessed basketball life. NBA stars rise and fall in performance and popularity, but the loudest cheers, the biggest crowds, the most reverential treatment never changes for Bryant. He's a transcendent icon overseas, borne of an unparalleled blend of life as a Laker and winner of five championships, two scoring titles, and an MVP award. What's more, Bryant is one of them. In his formative years, Europe was home. He speaks Italian and Spanish. He hangs around soccer stadiums. Bryant travels to Europe and it all comes so easily to him. As he chases his second gold medal with Team USA in these Olympic Games, his basketball future in Europe remains ripe with possibilities. Asked about the possibility of playing a season in Europe, Bryant told Yahoo! Sports: "It would be natural for me to go do it. It wouldn't be a stretch at all. I grew up here." 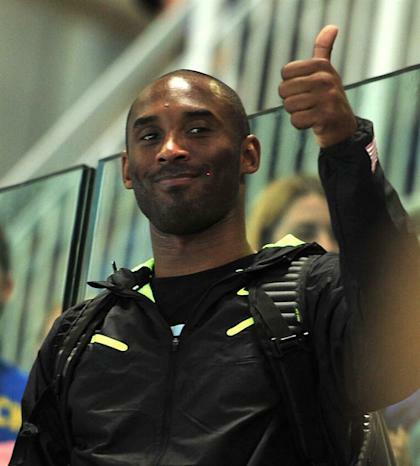 Bryant plans to play out the final two years of his Lakers contract and reassess everything. He's still performing on an All-Star level, and his knees are holding up with his 34th birthday approaching this month. As the son of Italian League star Joe Bryant, he lived in Italy for several years as a child. His memories of Italy's pro league plush, Bryant still gushes over witnessing the scoring genius of Brazilian star Oscar Schmidt in Italy. There's so much sentimentality about Italy and so much more of a business acumen about his ability to push product in Europe. He'll be selling Nikes forever here. If Bryant ever wanted to make this leap at the end of his career, his decision on where to play would be an intriguing one. "You'd have to look at the market and what's going on in terms of the level of basketball being played," Bryant said. "I understand there's a high level of competitive basketball in Turkey now. They might have the best league in Europe. Spain has obviously been one of the top leagues for a long time. "And Italy is a place that's dear in my heart, I grew up there, but the level is not where it used to be. When I was growing up over there, that was the best league in Europe." Bryant considered several offers in the lockout and had been destined to sign with a team in China for $2 million per month until the China Basketball Association passed a rule forbidding its teams to sign NBA players with existing contracts. Once talks with the CBA were squashed, Bryant had detailed discussions with Virtus Bologna of the Italian League. His agent, Rob Pelinka, went deep into discussions about a deal where the entire Italian League could've benefited financially and shared proceeds and the costs of his salary. Bryant and the Italian League never did agree on terms, and eventually the end of the lockout stopped the discussions. Nevertheless, Bryant goes to Rome and speaks Italian, goes to Barcelona and speaks Spanish, and that goes a long, long way in Europe. On Team USA's stop in Barcelona, Bryant and Pau Gasol shared the stage at a promotional event at a downtown Nike store. Once they were gone, it was the bigger-than-life Bryant posters that stayed in the store windows and on the walls. Gasol is a son of Spain, and he still remained Bryant's sidekick before a pre-Olympic exhibition game in the nation. Bryant's stature has also boomed in Asia, and his offseasons include Nike tours of the Far East. LeBron James has usurped him as the best player in the NBA, but Bryant's never lost the tightest grip on the global community. Bryant has never shown an inclination to want a part of NBA ownership unless it was a major-market moneymaker. What Michael Jordan has done in Charlotte – losing a lot of money and a lot of games with a failing NBA franchise – holds no appeal for him. Yet Europe is different. For several years, Bryant had a significant ownership stake in Olimpia Milano of the Italian League. Owning a European soccer team probably intrigues him more now, but he insists the possibility of investing seriously in another basketball team here couldn't be a trivial pursuit. "I'd have to make that a decision to make it a full-time thing," he said. "If this is something that I decided I wanted to pursue, I'm not going to buy it and just let somebody else run it. If I'm going to make the investment, I'm going to run it. I'm going to know the ins-and-outs of the business and how to run it the right way." For now, Bryant and Team USA get Argentina on Monday in the final preliminary game before medal-round play starts Wednesday. He's still chasing his second gold medal with Team USA, and his sixth championship with the Lakers this season. Bryant smiled and reminded everyone the other day, "I ain't done yet." And yet when he finally is, goodbye could come on a farewell tour back where it all started in Europe, back where it may yet feel natural enough to wear a uniform one final time.